He has completed a successful decade in Sandalwood, crossed the 25 film mark and says “he has just started”. 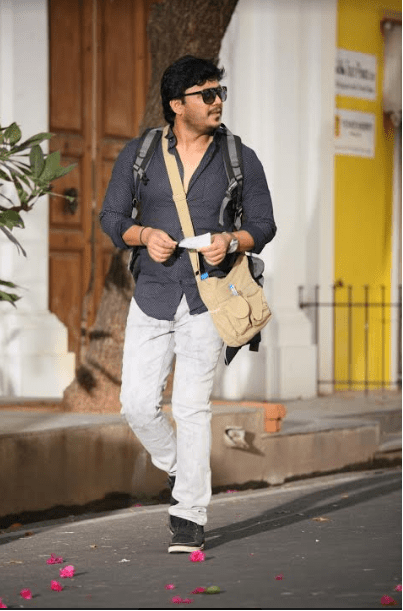 Rightfully given the title Golden Star, Ganesh is also easily the most affable and amicable star and actor who makes this conversation seem like a breeze. A self admitted bundle of energy who has the need to be doing something all the time, Ganesh is a delight to speak to as he tells us more in this exclusive tête-à-tête. Ganesh also says that today the audience has matured to become receptive to varied cinema and has evolved to becoming accepting of unusual scripts and stories. “Now we can see makers doing so much different work say for example Pawan Kumar’s U-Turn or Lucia. Also now the number of multiplexes has increased over the decade and ticket values have gone up but audiences want to watch movies in luxury. All this helps us to have better budgets and locations apart from investing in designers to craft the look of the entire cast that adds value to the film.” This means that the film starts earning more and soon which helps the industry as such. Likewise he is also happy to be back on television with the third season of the hit show Super Minute. “This is a hit franchisee which will take us into many homes. What I like is that it has a social angle and we are able to help someone in need, maybe educate a person or help an ailing person with medical care and that is immensely satisfying. I am very emotionally attached to the show as it helps me connect with real people and understand what they need and that is something that money can never buy.” Ganesh has also become active on social media over the last 6-7 months and says it feels great when you connect to audiences directly. “As soon as I uploaded the trailer of Pataki, it got a whopping 2 million views and when the film releases even if half of them come to theatres, it is great. Also fans are updated directly with real news.” But what about the flip side of social media I ask him and he is clear that he will not respond to unnecessary comments and prefers to let his work do the talking. He also admits he is in talks with Pawan Kumar for his next film based on nicotine. “Yes, I have read the script twice and we are talking on how to take it forward. Also Pawan is a great guy and we know each other from long. In fact he has acted in my movie Circus also.” He is all set to start shooting for Chamak directed by Suni and then move on to Orange to be directed by Prashanth Raj. Keeping busy is second nature to Ganesh and he says he enjoys spending time with his kids when at home, chilling out playing games and watching movies. Here is wishing the star with a golden heart more success! This story appeared in Deccan Herald’s Sunday Herald dated 14th May 2017 here.